Yesterday now seems a long way away. I am left with aches and pains that leave me unable to get up again if I've had a long sit down. But it was worth it! And after the antics of Friday's bin round, I came home to a copy of our local paper the Bury Free Press. 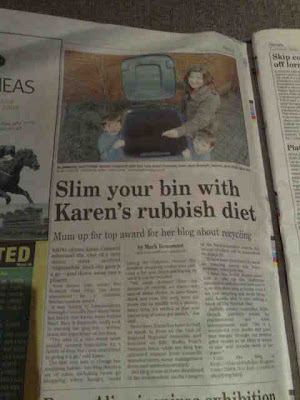 And there it was, a huge write-up about The Rubbish Diet on page 4, with a photo of me and the little ones posing with our empty black bin. It was Wednesday that the photographer visited. "Could we take a photo of you dangling a plaster over your wheelie bin?" she asked, as soon as she arrived at the door. I agreed but warned her it was around the back. But it wasn't just around the back of the house. That would have been too easy. It was up the garden, along the back path, fighting against the garden foliage, through the back gate, across the communal drive and finally in front of the garage stood the bin! As soon as we got there, the kids grabbed the wheelie bin in excitement and pulled it into position. After a few shots, the deed was done and we could return to the garden, across the drive, through the back gate, along the short path, beating down the foliage and then through the garden to the house. And that's what it's like every time I need to put out the rubbish bin. I can't believe it's been almost a year since I moved it. I figured that we were hardly putting out any rubbish, so we moved it from the side of the house, where it was in the way, to the garage where it was nicely out of sight. It's a good job I hardly have to do it eh as it's certainly a disincentive keeping the wheelie bin that far away from the house, especially when it's raining. Oh no we have to go through it! So thankfully it was a lovely sunny day when the photographer came to visit, otherwise she would have needed a pair of wellie boots and calves that could defeat quick sand. But I am even more thankful that Mr A hadn't lived up to his reputation. "So you were lucky I hadn't emptied out the garage then!" Could you imagine the shock that would have given me. You can just picture the headline, can't you! "Zero Waste Woman hits Maximum Waste." With the plaster dangling over a binload! But don't forget, the other big news is that this week is supposed to be our Maximum Waste challenge, to see if we can go back to our old habits and chuck an enormous amount of stuff into landfill. And Mr A has been given free rein to do what he wants, without me standing over him telling him what goes where. This bin - that bin - t'other! But I think he's actually forgotten. Either that or he is now a true convert! Because I don't think I could really let him fill up the black bin, not like how he used to. Especially when we have a local Freecycle where things that he would have once thrown away could be put to good use. And aside from my worries about waste, could you imagine how embarrassing it would be if we had any other visitors from the press. "Let me introduce you to our almost empty bin" I'd say. "Think you've got the wrong one there love" They'd answer, thinking they'd got a scoop! Then there'd be the cost of therapy! Hmm. I think I've got to keep a close eye on that Mr A, especially as there is just one more day to go in this mad challenge. And tomorrow is a Sunday, always a dangerous day for throwing out clutter. I know it would mean he'd pass the Maximum Waste challenge, but I think I might just have to keep him tied-up. And I don't mean busy either. I prefer the literal alternative. With a ball of string and a post! Ah that should do it. Huge thanks to the Bury Free Press for the article, and to the East Anglian Daily Times, Heart FM and James Hazell at Radio Suffolk for the other media coverage this week as well as to Suffolk CC and St Edmundsbury for sharing the good news. Thanks also to Radio Suffolk's Lesley Dolphin for yesterday's update on my Red Nose Day sponsored Bin Round. The Rubbish Diet reader community has donated almost £200 for Comic Relief, which is absolutely fabulous. I don't have to eat less. I have lost 33 lbs in 9 weeks and my BMI has gone from 42.4 down to 38.7. I would like to share how I have done it. it sounds like you've had a great week, Mrs A and I'm very excited about Mr A's convertness. Let's hope it's now second nature to him too. Good to see the boys sharing the limlight. After all, Zero Waste for children is the most demanding part. Maybe they will write a book of their experiences. A title could be: Zero Waste : Zero Sweeties.